CHICAGO—The fall season of the School of the Art Institute of Chicago’s (SAIC) critically acclaimed series Conversations at the Edge begins September 13 with a distinguished lineup of screenings, performances and talks by groundbreaking artists who exemplify the boundary-blurring nature of experimental media. Artists include SAIC alum Steffani Jemison (MFA 2009), whose practice draws upon Black vernacular culture to produce new modes of expression through performance, music, video and installation; Colombian filmmaker Camilo Restrepo, whose award-winning films explore personal and political trauma, survival and resistance; and Chicago-based new media artist and SAIC faculty member jonCates, who mixes the urgency of punk with the poetics of glitch. Programs take place Thursdays at 6 p.m. at the Gene Siskel Film Center, 164 N. State St.
From 1950 through the late 1990s, Scottish film-poet Margaret Tait crafted an exquisite body of work that combined portraiture, music, ethnography and animation. This program features her most celebrated midcentury films, some screening for the first time in Chicago. Spanning performance, music, video, and installation, Steffani Jemison's (MFA 2009) practice draws upon Black vernacular culture to produce new modes of expression. She presents a selection of audio works alongside her latest video, “Sensus Plenior” (2017). In the 1970s, Manhattan-based artist Stephen Varble gained infamy for his gender-confounding costume performances. Art historian David Getsy presents excerpts of Varble's ribald unfinished epic, “Journey to the Sun,” which the artist worked on from 1978 to his death in 1984. Artist and animator Peter Burr creates videos, performances and video games that conjure virtual spaces and illusive patterns. 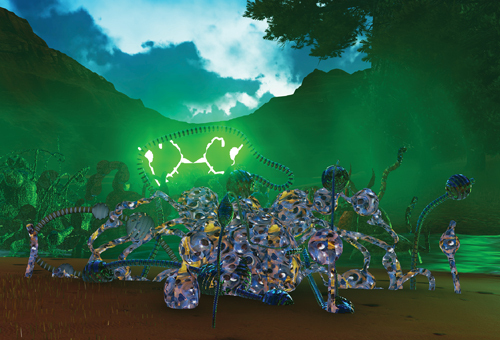 Burr presents a selection of single-channel computer animations related to his expansive projects, including “Aria End,” his collaboration with the game designer Porpentine. The influential work of Chicago-based new media artist jonCates mixes the urgency of punk with the poetics of glitch. His latest project, a glitch Western, takes shape as a feature film and interactive game that critiques the myths and ideology of the American West. The Gene Siskel Film Center's Panorama Latinx short film showcase, Cortadito, is an eight film program featuring Chicago-based Latinx filmmakers. On April 26, the Legacy Museum: From Enslavement to Mass Incarceration in Montgomery, Alabama, is slated to open along with the National Memorial for Peace and Justice which is the first memorial dedicated to the legacy of enslaved Black people, people terrorized by lynching, African Americans humiliated by racial segregation and Jim Crow, and people of color burdened with contemporary presumptions of guilt and police violence.